This fidget spinner comes in a variety of colors starting at around $9 and they ship with prime! I love that we got ours in 2 days. 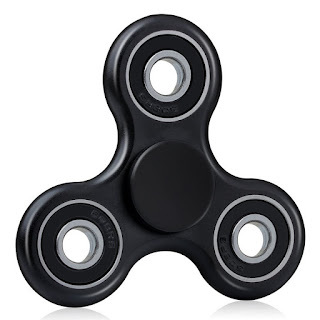 So I asked my son what he thought of this fidget spinner, and he said it definitely spins faster than some of the others he has tried, and its very quiet, and spins for quite a while. A lot of the spinners say they spin for 2 or 3 minutes, but that's under perfect circumstances. The ones we have tried spin for about 45, this one spins almost a minute! High quality small bearing, longer time, small noise: using specially manufactured high quality small bearings, fast speed, more smooth, small friction, turn longer than others, and small noise. Bearing is not easy to fall off: special process, the bearing is closer to the spinner, very firm, not easy to fall off. Strict product inspection procedures to ensure each one is a great quality product. Ultra-durable POM plastic Body, Non-3D Printed,These bearings use the latest low-friction technology by incorporating a small bearings to ensure longevity and smooth rotation,Easy To Carry,Small,Simple,Discrete and Fun.